Today, the swearing in ceremony for our 23rd Prime Minister was held in Ottawa. 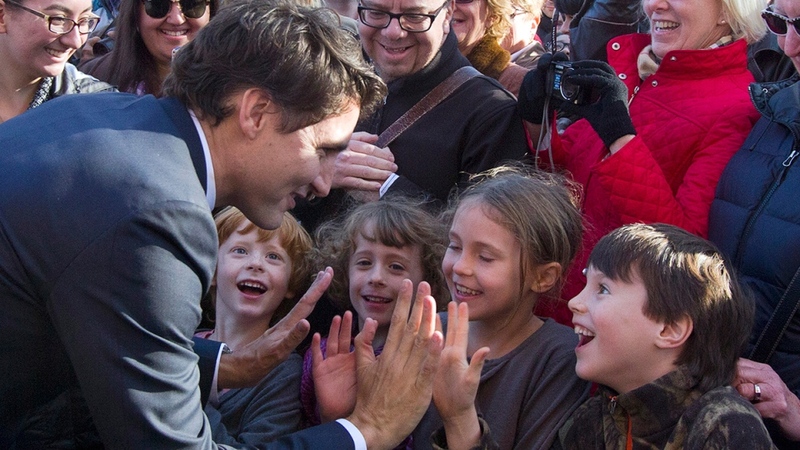 Our New Minister high-fiving kids before today’s ceremony, photo from ctvnews.ca. Our outgoing Prime Minister had become famous for controlling guests lists to traditionally public events, restricting media access and even controlling what our scientists are allowed to say about important issues like climate change. He has an old-fashioned idea about women and their place in the world. So it was refreshing to watch our new Prime Minister and his cabinet sworn in, a cabinet that represents the diverse cultures of Canada. It’s also the first cabinet in the history of Canada to have gender parity. The quote truly doesn’t capture the moment, so click on the link and watch the video clip. I’ll wait. So, yes. I know governments tend to be all the same. I know politicians bend the truth and have hidden agendas. But man, I can’t help but be a tiny bit hopeful that maybe we’re in for a positive change.